The Bartlesville Symphony Orchestra will host internationally acclaimed pianist Daniel Epstein in his first ever trip to Bartlesville on Saturday. Esptein will perform alongside the Bartlesville Symphony Orchestra in their orchestral performance titled Pianistic Passion. BSO Music Director Lauren Green said the two winners of BSO's 2019 Myrna Hershberger Young Artist Competition will also be performing. 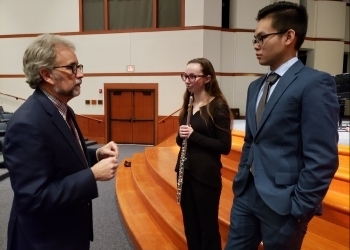 He said the 2019 Young Artist Competition winners were vocalist Stone Yang and flautist Brooke Oliver. Yang is a junior at Bartlesville High School and his parents are Qing Yang and Lucy Jiang. He sang “Largo al Factotum” by composer Gioachino Rossini accompanied by his music teacher, Lesa Steele. He will perform Gioacchion Rossini's "Largo al factotum" from The Barber of Seville on Saturday. Oliver entered the competition to challenge herself by performing a difficult piece as a soloist and was excited by the thought of playing with the Bartlesville Symphony Orchestra. She will perform Wolfgang Amadeus Mozart's flute "Conerto No. 2 in D Major." Both Yang and Oliver won the honor back in January. The Pianistic Passion performance at the Bartlesville Community Center will take place on Saturday, March 23 at 7:30 PM. Single ticket prices for the event range anywhere from $14 to $44. For more information, you can call the Bartlesville Community Center at 918.337.2787.